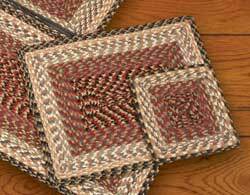 Set a rustic, country, or primitive table with one of our braided cotton placemats, featuring a variety of colors. 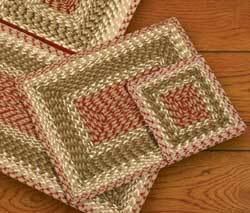 This is for our rectangle and oval braided cotton placemats. Most of these also have matching items, such as rugs, chair pads, table runners, and more! 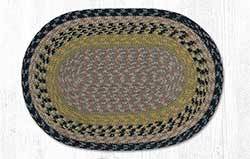 Brown, Black, & Charcoal Cotton Tweed Placemat, by Capitol Earth Rugs. 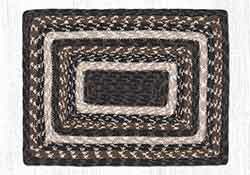 Made of braided cotton in mainly black, brown, and soft greys. Measures 13 x 19 inches. 69% cotton, 22% polyester, 4% Acrylic, 3% Rayon, 1% Nylon, 1% Others; brush or shake clean, spot with a damp cloth, or dry clean. 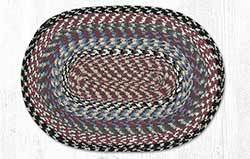 Burgundy and Gray Cotton Braid Placemat, by Capitol Earth Rugs. Made of a cotton blend, braided into a tweed. 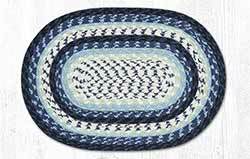 This is for the OVAL shaped Placemat. Measures 13 x 19 inches. 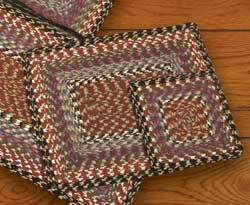 Burgundy, Black, and Tan Cotton Tweed Placemat, by Capitol Earth Rugs. Made of braided cotton in mainly wine red, black, creme, and tan. Measures 13 x 19 inches. 69% cotton, 22% polyester, 4% Acrylic, 3% Rayon, 1% Nylon, 1% Others; brush or shake clean, spot with a damp cloth, or dry clean. 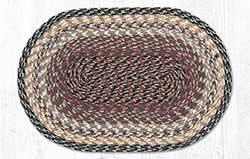 Burgundy, Gray, and Creme Cotton Braid Placemat, by Capitol Earth Rugs. Made of a cotton blend, braided into a tweed. 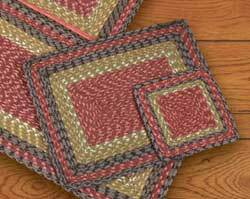 This is for the RECTANGLE-shaped Placemat. Measures 13.25 x 17.25 inches. 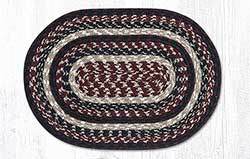 Burgundy, Gray, and Creme Cotton Braid Placemat, by Capitol Earth Rugs. Made of a cotton blend, braided into a tweed. 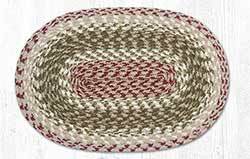 This is for the OVAL shaped Placemat. Measures 13 x 19 inches. 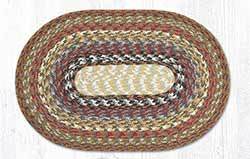 Burgundy, Grey, & Mustard Cotton Tweed Placemat, by Capitol Earth Rugs. Made of braided cotton in mainly barn red, mustard gold, and soft grey. Measures 13 x 19 inches. 69% cotton, 22% polyester, 4% Acrylic, 3% Rayon, 1% Nylon, 1% Others; brush or shake clean, spot with a damp cloth, or dry clean. 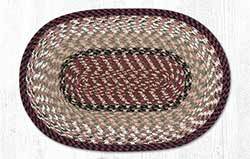 Burgundy, Olive, & Charcoal Cotton Tweed Placemat, by Capitol Earth Rugs. Made of braided cotton in mainly red, charcoal grey, and neutral olive green. Measures 13 x 19 inches. 69% cotton, 22% polyester, 4% Acrylic, 3% Rayon, 1% Nylon, 1% Others; brush or shake clean, spot with a damp cloth, or dry clean. 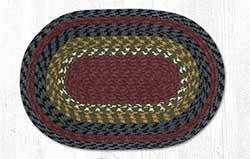 Burgundy, Olive, and Charcoal Cotton Braid Placemat, by Capitol Earth Rugs. Made of a cotton blend, braided into a tweed. 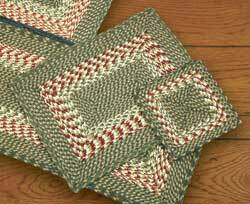 This is for the RECTANGLE-shaped Placemat. Measures 13.25 x 17.25 inches. 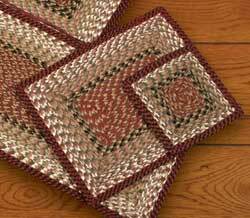 Honey, Vanilla, & Ginger Cotton Tweed Placemat, by Capitol Earth Rugs. Made of braided cotton in warm spicey colors of tans, creme, and ginger. Measures 13 x 19 inches. 69% cotton, 22% polyester, 4% Acrylic, 3% Rayon, 1% Nylon, 1% Others; brush or shake clean, spot with a damp cloth, or dry clean. 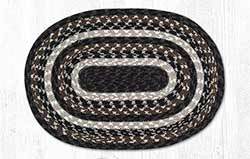 Made with braided cotton, in black, browns, and creme. 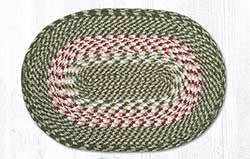 Olive, Burgundy, and Gray Cotton Braid Placemat, by Capitol Earth Rugs. Made of a cotton blend, braided into a tweed. 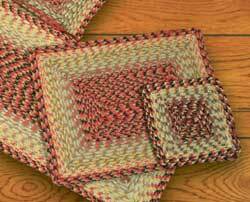 This is for the RECTANGLE-shaped Placemat. Measures 13.25 x 17.25 inches. 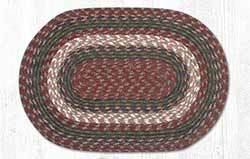 Olive, Burgundy, and Gray Cotton Braid Placemat, by Capitol Earth Rugs. Made of a cotton blend, braided into a tweed. 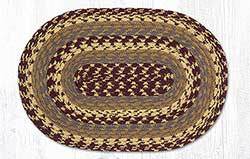 This is for the OVAL shaped Placemat. Measures 13 x 19 inches.